What Are The E-Mini S&P Futures? The E-Mini futures were originally launched in September 1997 to attract non-professional investors into trading index futures. Previously, the only game in town had been the “large” SP contract – but it had become too expensive for the ‘little guy’ to trade. So the CME created the E-Mini contract which was 1/5th the size of the “large” S&P 500 futures contract and required 1/5th the margin to trade. Over the past decade the E-mini has become a huge success. Not only with retail but with institutional traders too. Now everyone trades the E-Mini: mutual funds, pension funds, hedge funds, insurance companies, high frequency trading (HFT) firms, trading syndicates and individual/non-professional traders. And we here at Evil Speculator are no exception as the E-Mini has always been a mainstay of my trading activities. Right around the launch of this blog in 2008 I was researching various ways of better measuring participation and trading momentum in the E-Mini and in the process developed a market oscillator I ended up calling the Zero. What Is The Zero Indicator? The Zero is a simple to use but at the same time sophisticated and accurate market trend and momentum indicator. Its purpose is to alert us when an trend reversal in the underlying is about to unfold. Thus it should not be considered a lagging indicator – actually quite to the contrary. The optimum time frame for this indicator appears to be an hourly chart, therefore it is thought to be best used for medium term trading (i.e. trades lasting several days to maybe a little over a week). Intra-day the Zero Lite on the right side of the chart is where all of the action is. Short term traders have come to appreciate the appearance of price/signal divergences which often are precursors of developing short term trend changes. Seasoned traders may also find value in the Zero by correlating their own analysis with the indicator running against a major average such as the S&P 500, Dow Jones, or NASDAQ. Sign Up Now For The Zero Indicator! If you have any questions or suggestions then feel free to drop me a line. You can read the tutorial below but quite frankly the best way to realize the potential and advantages the Zero indicator offers is to watch some of the wrap up videos I have produced in the past few years. Not only are they entertaining but they also highlight key observations such as divergences, reversal signals, waning participation, trend day tape, etc. Shown below are some of the highlights but there’s quite a bit more in our Zero videos page. The idea behind the Primary Zero indicator (PZI) is to get positioned at the very cusp of trend reversals. The average period of a trade is measured in days, thus no haste should be taken when initiating trades. The Zero Lite on the right side of the live chart should be mainly used for intra-day swing trading. Sandwiched between the price chart and the Zero Indicator you find the Mole Oscillator, which is an additional rendition of the Zero. Its purpose is to render the level of participation in the form of an activity bubble in which the lower red signal represents selling pressure and the upper green signal represents buying pressure. The white dotted line in the center indicates the current direction of the buy/sell participation ratio. The Mole should be seen as a different way of visualizing the Zero – as a matter of fact it represents an early version of the Zero Indicator. It has been added to the Zero chart since it often offers valuable clues as to impending swings in momentum or shifts in participation. For example – be on alert when you see the Mole’s ‘bubble’ expand or contract – the former indicating strengthening and the latter a weakening of the current trend. Bubble Expands on both sides but green line dominates the red line. Dotted white line above the zero mark and pointing up. Dotted white line near or touching the green line. Red line near zero mark while green line pushes to the upside. Bubble Expands on both sides but red line dominates the green line. Dotted white line below the zero mark and pointing down. Dotted white line near or touching the red line. Green line near zero mark while red line pushes to the downside. White line below the zero mark and pointing up. White line above the zero mark and pointing down. On the left side you see our primary zero indicator (PZI), which spans 5 days on a 1-hour chart. 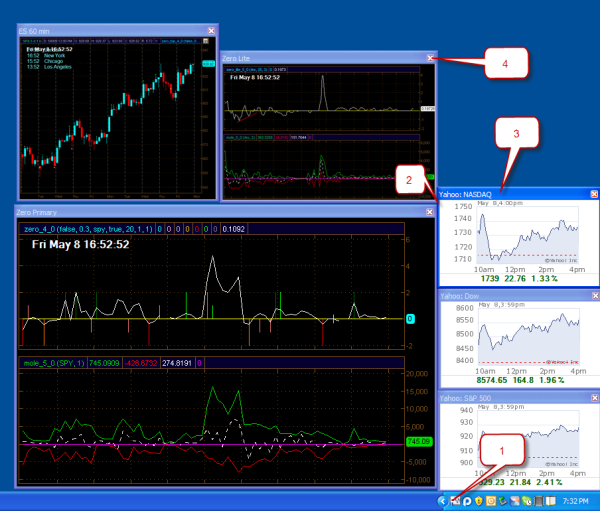 On the right side you find the Zero Lite Indicator (ZLI), which spans 2 days on a 5-min chart. Under volatile conditions the ZLI can be useful as an early warning system for sudden slingshot rallies or sudden drops. It can also serve as a great tool for swing traders as it appears to be effective in identifying turning points in price action via divergences. For example: Note how the 5-min candles on the right hand side of the chart are painting a double bottom around the 1090 level, while the ZLI is is still below the zero mark but painting a divergence as marked by the red trend line. This is often a sign that a trend reversal is imminent. In a volatile market environment high velocity directional price changes are often caused by program trading and HFT (high frequency trading) as a large volumes of orders suddenly hit the market in a very small amount of time. This may be caused by an important price level being breached, a long term moving average being crossed, or perhaps by external news causing traders to either enter into or exit out of a large number of contracts. The ZLI can be helpful in recognizing such slingshot moves so that early exits/entries may be taken. 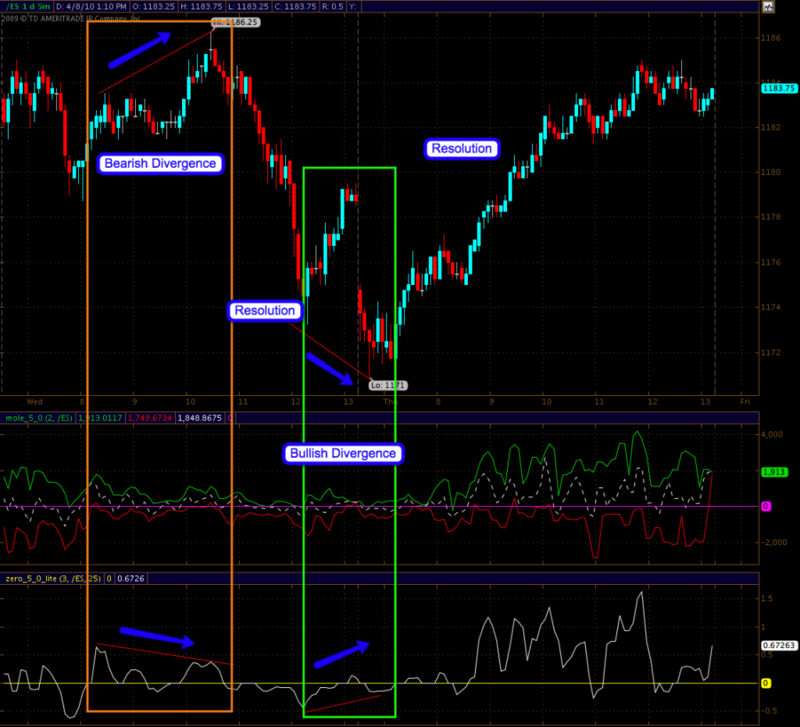 Shown on this chart are two textbook occurances of signal/price divergences on the ZLI. The first one framed in orange represents a bearish divergence. We call it a divergence because the strength of the positive signal appears to be diminishing while the ES futures happily continue to climb higher. If we draw a line from the respective peaks on the ZLI on the bottom and the ES price chart on the top we find that the peaks on the ZLI are trending down – at the same time the ES price peaks are trending up. In technical analysis this is called a price/signal divergence and as you can see on the chart, taking a contrarian position (i.e. 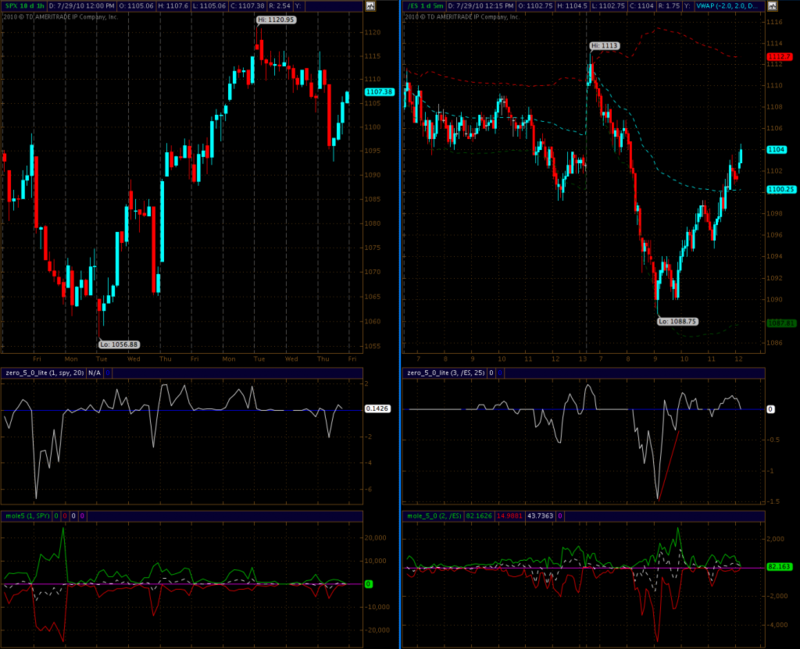 going short the ES futures) proved to be quite profitable. The inverse example of a textbook bullish divergence occurred the very next day. Again we see a divergence between the ZLI and the ES futures – just that in this case price is trending downward while the ZLI’s signal line is trending upward. Bear in mind that taking a contrarian position when divergences occur is not a guarantee for success. However in the twelve months since the introduction of the ZLI these type of divergences appear to resolve as expected a majority of the time. Now, after you are doing that, you are NOT looking at a webpage anymore, you are looking at the raw PNG image. In order to auto-reload that one simply right click (or Control-click in Apple) in an area outside the image (otherwise you only get the image options). Scroll down to ‘ReloadEvery’ and select ‘Reload Every 1m’. Please do not select anything shorter than that as it won’t give you a newer image and we are only uploading one to the server once every minute anyway. Voila – now you’re auto-reloading the image itself. You can set the page to full screen (F11 on Firefox) and you should be good to go. Full resolution screen grab, which auto-reloads once every 30 seconds. This should also be faster for you as it doesn’t auto-reload the rest of the page. UPDATE: There is also an auto-reloader for Google Chrome now – similar functionality. Firefox: You can either hit ALT + on your keyboard or simply click on the image once to magnify it. Internet Explorer: Move your mouse into the image and don’t move it for a few seconds. You will see a box on the bottom right of the image. Clicking that box will expand the size to the full resolution. Unfortunately this tool does not work in Mac OS X but I hear it might be possible to use Mono – however I have not tried this myself and it’s probably a bit experimental. Zero, or you could just grab the Zero Lite and the PZT. Once you click Add, it will create a widget in Dashboard. To get dashboard to open, you have to click the ‘Dashboard’ logo on the dock. You can also just press down on the scroll wheel on your mighty mouse which should bring up all widgets, or just hit F4. Why does does the tip of the Zero move? The zero is a technical chart indicator just like the MACD, the RSI, or a stochastic. Therefore it behaves very similarly, in that that the tip of the line changes along with the underlying symbol until the current interval of the chart is over. That means on a 1-hour chart the tip of the zero might keep moving until that hour is over. At that time, and only then, will the final position of the signal line become permanent. The live image on the page seems stuck! Firefox: Press the SHIFT key while clicking on the reload button. Internet Explorer: Press the CTRL key while clicking on the reload button. If the new image still seems out of sync by more than a minute or two (the system time is on the top left in the black square), then please alert us by posting on the blog or by sending an email to admin@evilspeculator.com. Can you make changes to the colors or layout of the Zero chart? Sorry, but after months of testing and gathering input we have arrived at a layout and color scheme that is enjoyed by the majority of our subscribers.